The following hints and tips were all originally published in our mail-out newsletter. If you wish to receive this newsletter please contact us at the numbers above or via the online contact form to be included in the Homecheck Services mailing list. By simply installing a roof ventilator, roof space temperatures can be reduced from 60 degrees C to 45 degrees C, in turn reducing the amount of heat radiating into the home. When was the last time you cleaned out your gutters and downpipe outlets? Full gutters mean rusty gutters! Poor drainage can contribute to major problems for Adelaide properties, as the typically reactive clay soils of the metropolitan area swell once waterlogged. Once the summer heat arrives, the cycle of soil expansion and contraction can lead to cracking in footings and walls. There is an excellent range of stormwater disposal pipes and drainage systems available to ensure water from downpipes is directed well away from the home. What you plant in your garden may have a long term telling affect on your home. Trees can provide valuable shade but understanding and managing the root system is vital. A single tree will extract moisture from a circular area equal to the height of the tree and an Australian tree or shrub can extract in excess of 100 litres of moisture from the soil in a day. Don't over-water or under-water your garden. Try to maintain constant minimum level of moisture in the soil near the home. 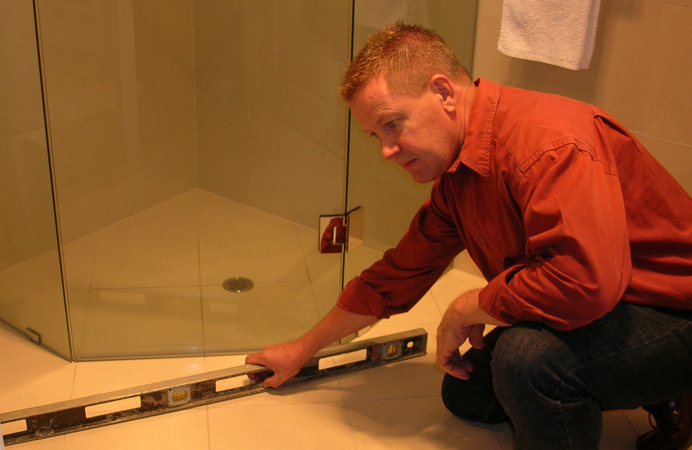 Regularly check the junction of the wall tiles and the floor tiles in the shower alcove . . . Replace with mould resistant flexible sealant such as "Ardex SE" every 2-3 years. Keep your wall vents clean and free of debris - good sub-floor ventilation is vital in controlling sub-floor dampness. Up to 12 litres of moisture per day is drawn into the roof space from shower and kitchen fans. This can cause mould and mildew. When was your home last treated for white ants? If it's more 5 years, it needs to be re-treated. There is a new treated timber-framing product now available that provides effective protection against termites. If you are building a new home or planning an addition where timber-framing is to be used, this product may be worth considering. Boral 'Pinegard Red' is treated to H2 level in accordance with Australian Standard 104 to give new homeowners peace of mind. The cost-effective frame needs no other protection and procedures such as spraying the grounds for termites may not be required. If you own a slow combustion heater, do yourself a favour and check the top of the flue, ie, the section that goes through the ceiling. The flue should have an additional "casing" or "sleeve" around the top of the flue, this is to protect the timber ceiling and roof framing from heat and possible fire. This "casing" or "sleeve" is referred to in the building industry as a "Flue Pipe Casing". If your heater does not have a Flue Pipe Casing fitted and you are unfortunate enough to have a fire, your home insurance company may be reluctant to approve you insurance claim. Part of any regular home maintenance is to check and re-check for any potential fire hazard. One of the first steps is to ensure you have a good fire evacuation plan: eg. plan where and how you will exit the home, should a fire occur.